Up to this point, our essay has concentrated on the connections between cortical neurons within a neighbourhood, say, 1 or 2 mm across, corresponding to the length of the longest horizontal axon collaterals plus the length of the longest dendrites. The influence which various kinds of stellate cells exert on the cortical network is indeed limited to a range even smaller than that, but many pyramidal cells have axons leaving the cortex for the subcortical white substance and re-entering the cortex in distant places. 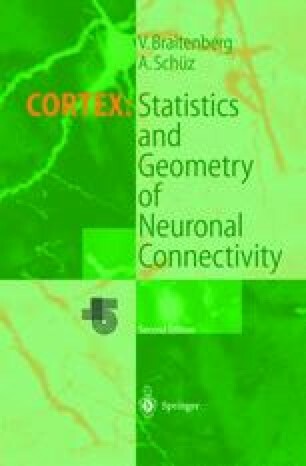 We estimate that this long-distance system of connections is about as powerful as that of the local connections, the estimate being based on a comparison between the apical and the basal dendrites of pyramidal cells. Judging from the relative size of the two portions of the dendritic tree, both receive about the same number of synapses, the first, we may assume, prevalently through long-range connections and the second through local ones. In a rough way this must be so, since the fibres mediating the long-range connections tend to terminate in the upper layers of the cortex, where apical dendrites from all layers ramify, while the local axon collaterals are distributed mostly below or at the level of the cell body and thus enter a neuropil consisting largely of basal dendrites of neighbouring cells.